2016-12-31 – It was a hard choice to pick a photo as the last photo of this year long project, but I went with this one for two reasons. First, Steph and Sean flew in from NYC to spend Christmas with us and her family and we were so excited to get to see them. But my second reason was equally as important. 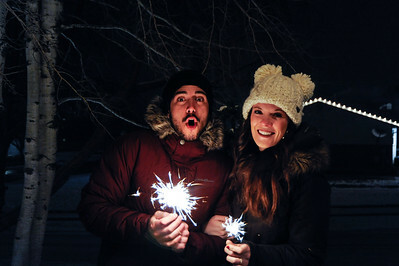 I thought it would be cool to end the year with them because last year I shot a similar photo after midnight and used it as my first photo of the year. So they are my project 366 bookends. 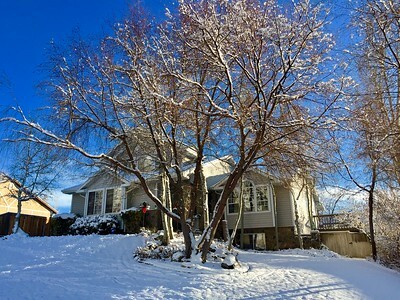 2016-12-30 – As much as I dislike shoveling the snow, I have to admit that it does make the yard beautiful, especially when the sky is this bright blue. 2016-12-29 – We were able to get the entire family over to my parents while everyone was in town and we used their game room to fit everyone and the food. When done we were cleaning up and putting things back in place. 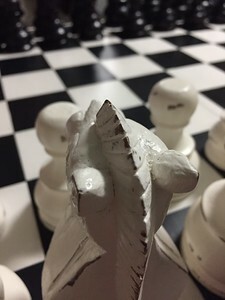 On one of the tables we had to set up an extra large chess set we had moved. This slightly warn piece caught my attention so I shot it against the checkered backdrop. 2016-12-28 – We were babbysitting Aili and Estee and took them outside to sled on the front yard. Grandma Lisa was showing them how to do it. If you ask me, she is having too much fun. 2016-12-27 – I purchased this plate in Germany a few years ago and had planned to put it on my BMW, but I never moved my MR.GOLF plate from the truck to the Z3. 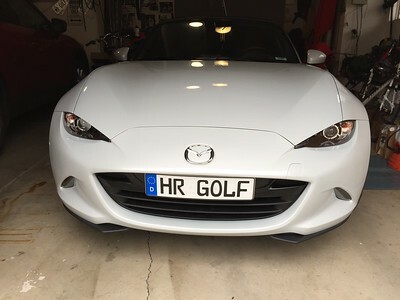 When I got my new Mazda MX-5 Roadster I immediately transferred the plates, so it made sense to finally put the European/German plate on the front. I love the look. It's just held on with heavy duty velcro so I hope the heat of summer doesn't cause the tape stickum to lose its grip. 2016-12-26 – We went over to see the gifts Santa left Aili and Estee, and we set up the tiny bounce house we gave Estee. 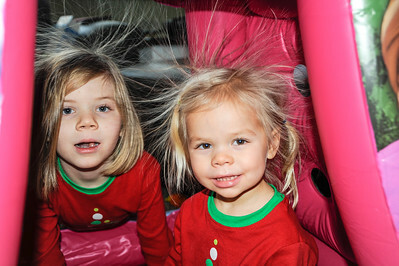 When they crawled in the static hit their hair and made it stand on end. They had no idea when I was taking the picture. 2016-12-25 – Christmas Eve we had no snow on the ground, but overnight it snowed and we woke to a white Christmas. It snowed off and on all day and then late in the day the sun broke below the clouds as the snow fell, making for a fun sunset photo for Christmas day. 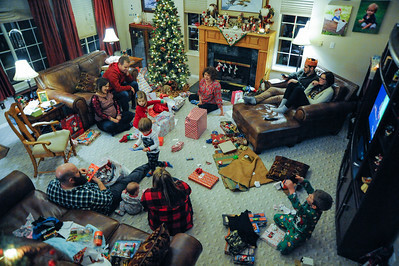 2016-12-24 – We had the entire family home for our traditional Christmas Eve. We had a fantastic meal. Then we did a rather elaborate Christmas Story enactment using everyone playing a part, mixed with songs. Then we got to the gifts. At least the gifts that Grandma and Grandpa were giving everyone. We had a wonderful time together. 2016-12-23 – This isn't a great photo, but has a great story behind it. Rovaniemi, Finland is the official hometown of Santa and they were live streaming on Facebook this morning as Santa was preparing to head out for Christmas. They had a large crowd gathered as he spoke to everyone. 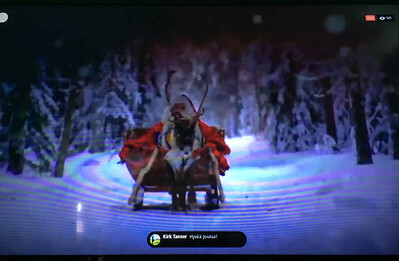 After a few Christmas songs he climbed into a sleigh with a single reindeer and rode into the forest. As I watched this happen I commented in Finnish, saying Merry Christmas. About 30 seconds later my name and comment popped up on the screen as part of the live feed. It was all I could do to grab my phone and take a quick photo. I thought it was really cool to participate in the event 9 times zones away. 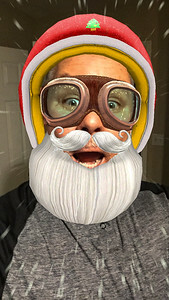 2016-12-22 – I did an update to my iPhone and discovered a new text feature that does like Snapchat. You pick the mask and it matches it to your face. As you move it moves with you. 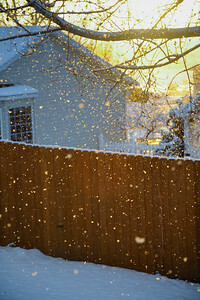 On this one, when I would open my mouth snow flakes would fly by like I was skiing downhill. I thought it was so funny so of course I took a photo. A Santa Selfie. 2016-12-21 – I went with Lisa to get groceries for Christmas eve dinner. As we were checking out I saw the candy chest they keep at each register. It is filled with penny candy for the little kids. 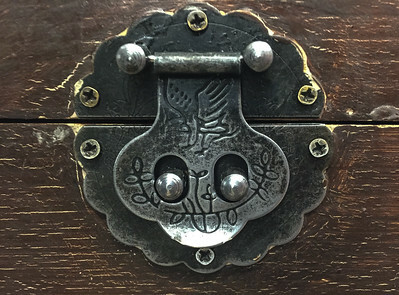 I've seen it for many years, but today the latch caught my attention as it looked like a face with big bulging eyes. Something from a Tim Burton movie. I had to get a picture. 2016-12-20 – Tim's wife came down sick so he took the day off to help take care of their baby and her. 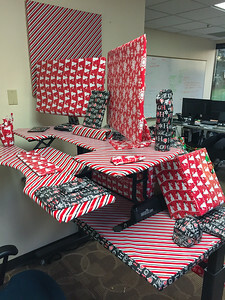 Since he was out we decided to bring him a little Christmas spirit by wrapping everything in his office. This might be more gifts than he has ever received. 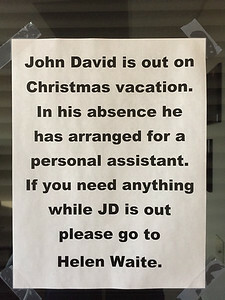 2016-12-19 – This sign is in the office door window of JD's office at work. It pretty much says it all. No explanation is really needed. 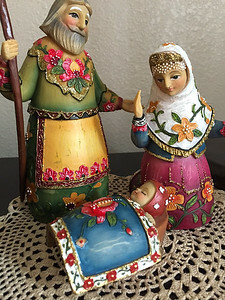 2016-12-18 – This is one of Lisa's nativity pieces in our home for Christmas. I believe we picked this one up in Ukraine. 2016-12-17 – The kids got together and planned a night at Riverwoods to see all the Christmas lights and Santa. We went along to enjoy the sites and get photos. 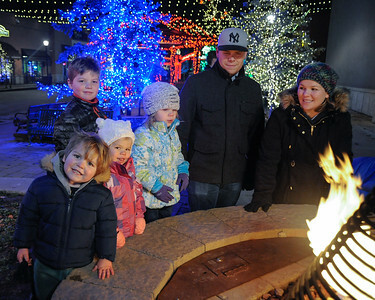 This was at the end of our evening, and even though the night was cold, the kids where still so happy and full of energy as we stood around the fire trying to enjoy a little warmth. I love these little ones. 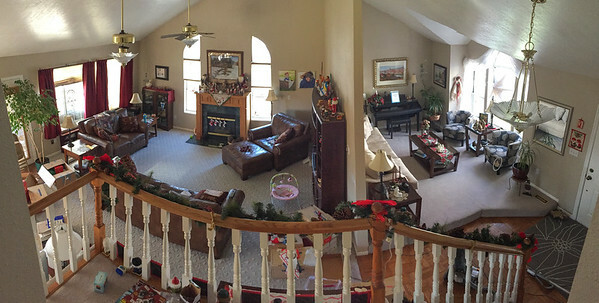 2016-12-16 – Lisa pretty much has the home decorated for Christmas now. This is one of her many tables. 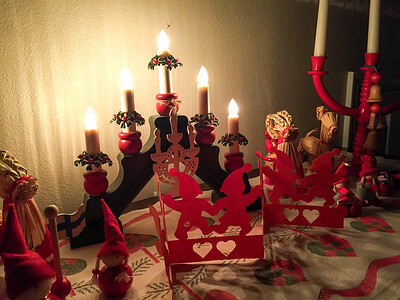 This one is totally Finnish Christmas pieces. I don't know if the Finns would view it the same way I do. To me it feels a little old world Europe. Either way, I like the feel it gives our home. 2016-12-15 – We've been playing a daily shuffleboard competition. First team to 20-wins gets lunch paid by the losing team. Our format is called Shuffle War. You have to slide all four pucks at the same time. 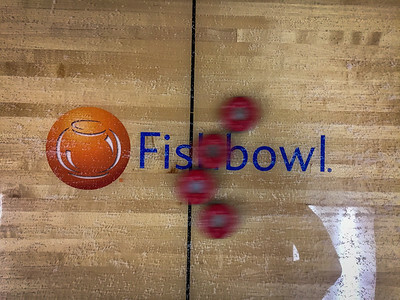 This shot is over the center of our table with the company logo as our opponents pucks came sliding by. I liked the blur of the pucks showing the action of our match. 2016-12-14 – The Fishbowl Marketing team had a special end-of-year, Christmas celebration, team building activity. We had all you can eat at Chuck-O-Rama and then went to the movies. This shot is about half of our team as we were finishing up lunch. 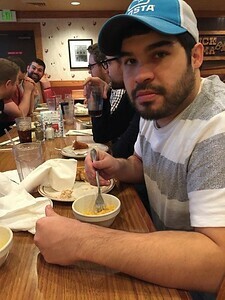 George Nelson, in the foreground, is finishing off his mac-n-cheese. It was really a good lunch that left us a little drowsy as we got to the movie. 2016-12-13 – I generally wouldn't include a video clip, but this one was too fun. 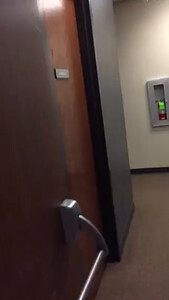 I had Derek follow me in the office shooting slow-mo video as I shot people with my Nerf gun. There were only a couple people still at work, and none of them were that phased by getting shot. So we headed back to our office, but I was in front. I launched my camera app and turned on the video and then got ahead of Derek so I could capture his reaction in slow-mo as I shot him. Worked as planned. 2016-12-12 Little Aili had her Christmas dance recital tonight. 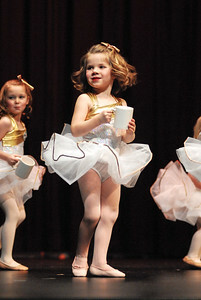 It was a short dance but at least Aili was right up front and was her typical self with big smiles and confidence. She is so cute and mature. So fun to watch her grow up and be so active given she has had two open heart surgeries. 2016-12-11 – I love being home and how comfortable our home is. It isn't anything fancy, but it is very comfortable and peaceful. Coming down the stairs from the bedrooms, you can see the family room and living room on the main level. This is where we live our lives, so I shot this pano to capture my view. 2016-12-10 – I saw John Daly win at Riverside to qualify for the PGA tour many years ago. Today I turned on the TV and they were playing the PNC Father/Son Challenge. 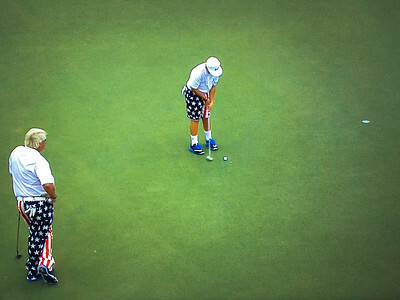 John Daly was playing with his son "Little John" or John Daly Jr. He is only 13 but was so good and comfortable under the pressure. I was really impressed. I took this photo on my TV to remember the day I first saw him play. He will likely do better than his dad on the tour when he is old enough. He was really fun to watch and grabbed the attention of all the event coverage people. 2016-12-09 – Lisa has been decorating the home for Christmas. One of my favorite areas in our house is our fireplace mantel. 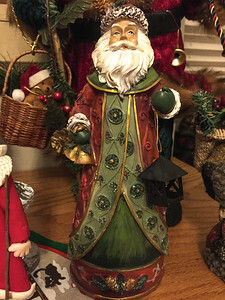 Lisa has collected many different Santa figures and fills the mantel with these figures. I like them all. Each is different, but this one caught my attention this evening. 2016-12-08 – We were given tickets at the last minute for the Tabernacle Choir Christmas Concert tonight. After the concert we walked the church grounds enjoying the lights. 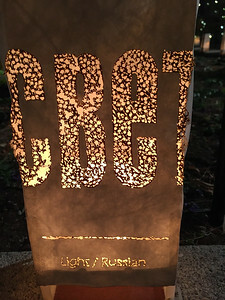 One of our favorite is the luminaria. We found the luminaria for Finland, Germany and Russia. It was a nice evening with my sweetie Lisa. 2016-12-07 – Tonight was our Fishbowl Christmas party. We held it at the new Noah's event center. It was our best one yet. 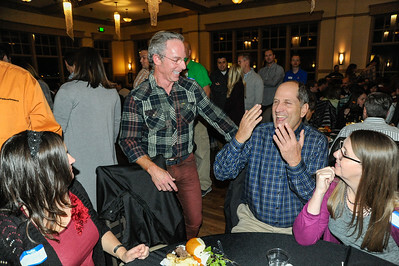 Dave Williams and Grant Kimball were remembering some of the early parties back when there were just 6 employees. It was a great evening. 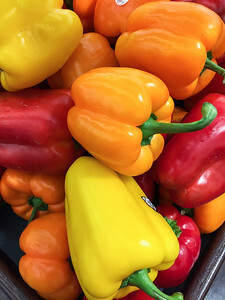 2016-12-06 – I was just walking through the Smiths grocery store and spotted these multicolored peppers. They were so colorful I had to stop and take a photo. I especially liked the green stems against the bold colors. 2016-12-05 – We spent the evening with Olin and Aanders building gingerbread houses. When we were done we played the Pie-in-the-Face game we gave Olin for his birthday. 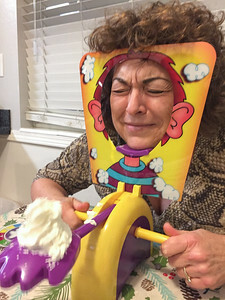 We would put whip cream on the hand, spin the dial and then turn the knobs the number of times you got on the dial. It always released on a random number. I got hit over and over. Lisa never got hit in the face. The anticipation is enough to kill you. 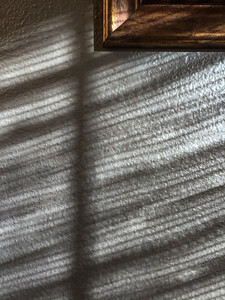 2016-12-04 – We've had so little sunshine the last while, so when the sunshine today was coming in the bathroom window through the wicker blind I noticed this shadow pattern on the wall beside the window. I like abstract patterns and images like this. I placed the corner of the frame in the image to anchor the image rather than let it look entirely abstract. 2016-12-03 – Olin had his 7th birthday party with his friends today, even though it was actually on November 25th. The party was a Skylanders theme. A game Olin likes. Here they had marshmallow cannons and were shooting marshmallows at each other. 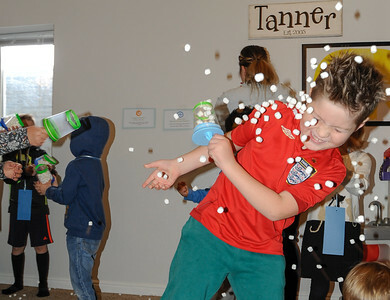 I got lucky with this shot as Olin's cousin Zinny got him in the face with a full load of mini marshmallows.